For more information on the Fission/Physion name change, click here. Physion’s structural split can be used to modify vocals in subtle or drastic ways. 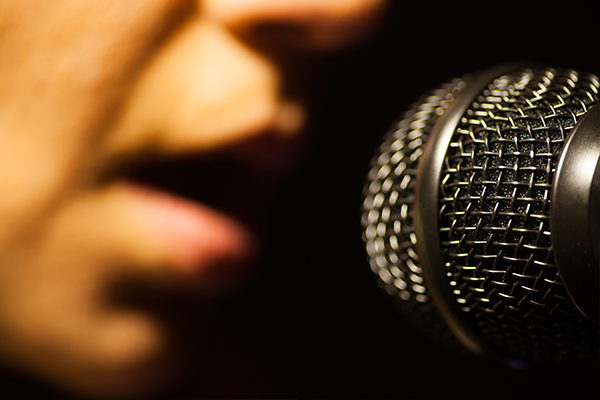 Emphasize or reduce sibilance, add or remove resonance, or turn robust vocals into whispers. 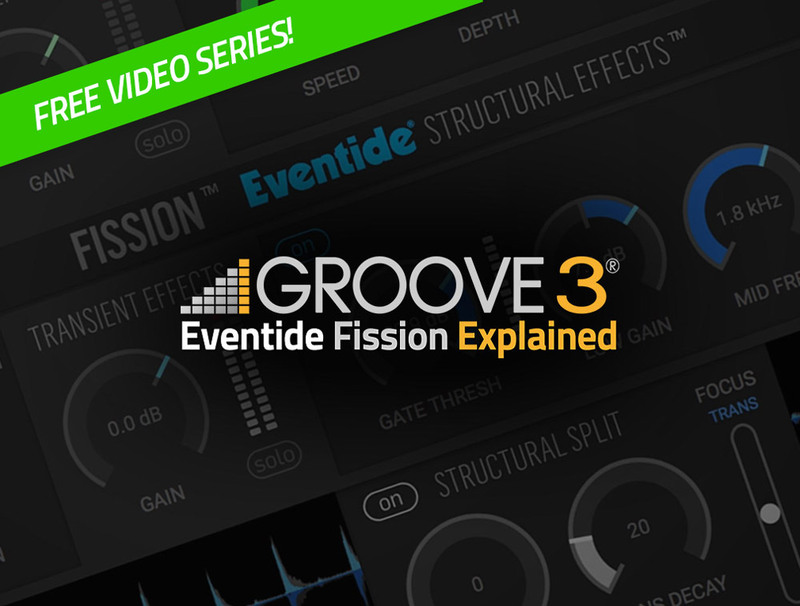 Eventide customers get FREE access to top-notch video tutorials created exclusively for Physion by our friends at Groove3! 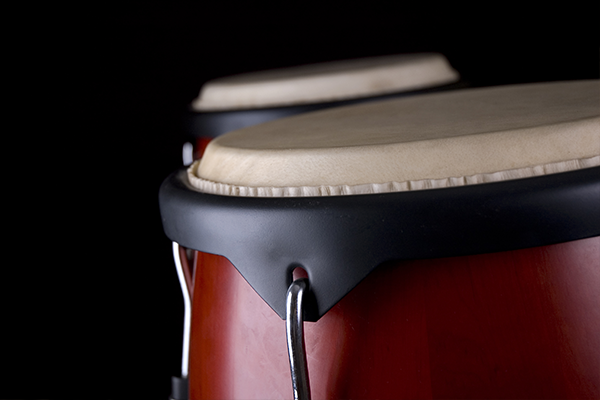 Visit Groove3 to learn more. 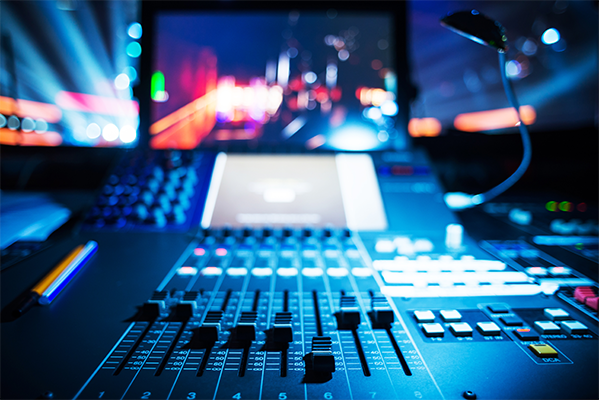 Adjust the FOCUS contol to 'fine tune' the parsing of the sound based on contextual and musical desires. FOCUS forces the method to favor one stream over the other. Sliding FOCUS toward tonal will result in a more staccato transient stream. Sliding FOCUS toward transient will result heavier transient tails along with tonal auto-swell. 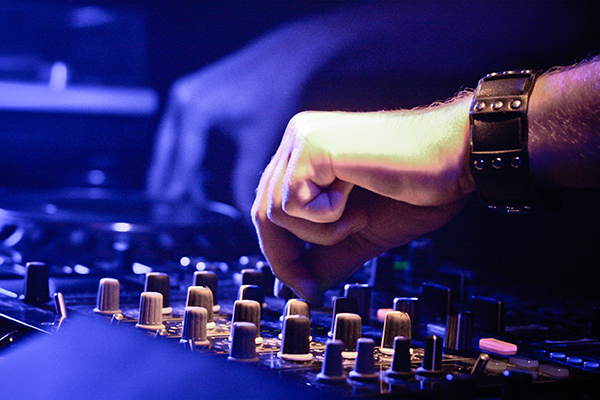 Extreme settings will push the entire signal to either the transient or tonal stream. The FOCUS control can be used to make subtle modifications like de-essing, de-reverberating or reducing pick noise by adjusting transient and tonal gain. SMOOTHING controls the speed of the decision-making process, preventing it from making too fast a decision either way. This is useful for trimming out unwanted transient chirps or smoothing rough transitions. Delay - A standard Delay echo effect with Tempo Sync capability and low and high cut filtering. Tap Delay - A multi-tap delay-line with Tempo Sync capability. Useful for rhythmic delays, wacky comb filtering, volume swells, or unique reverberant sounds. Dynamics - A combined Compressor/Limiter and Expander/Gate (function is determined by Ratio control). Phaser - A classic multi-stage allpass based Phaser effect, which can be controlled via LFO or Envelope. Reverb - A room Reverb designed with high echo density, imparting a fast and smooth build-up of reflections. This pairs nicely with transient sounds to create a sense of space without obvious echo slap back. Gate + EQ - A Gate followed by a 3-band overdrive-able EQ. Compressor - A standard Compressor/Limiter. EQ - A 3-band overdrive-able EQ. Delay - A standard Delay echo effect with Tempo Sync capability, modulation, and low and high cut filtering. Reverb - A large space Reverb designed with lower echo density (compared to Transient Reverb) and targeted high modal density with little to no modulation to avoid a chorusing sound on the tails. This allows the tonal audio to breathe in the space, yet evolve into dense pad-like reverberant tails. PitchShift - A 3-voice Pitch Shifter with +/- 1 octave shift per voice and an overall fine tuning control. Useful for retuning drums, creating harmonies, or micropitch chorusing/double-tracking all without transient slap back or smearing. Tremolo - A standard Tremolo effect which is driven by an LFO in (optional) combination with the Envelope of the plug-in’s input. It’s like no other effects processor on the market, and it offers enormous creative possibilities... Any source can be manipulated and tweaked in ways that were not possible before. Fission [Physion] is a monster. You can create delayed pick hits with phased undertones, reverbed plucks with dry-pitched tonal drones, slow bowed-sounding piano notes with tremolo wobble... and the list goes on and on. Fission’s [Physion] structural split functionality is an innovation not typically available in an effects plug-in. It rewards experimentation in more esoteric scenarios, but also works nicely for repairing audio. Fission [Physion] is the perfect tool to use when you are seeking to apply a more detailed approach to your engineering... It’s an idea that no other company to our knowledge has attempted, and Eventide has executed their idea resulting in the perfect plugin for this case. Apart from opening a new frontier in plug-ins, its strength is that it encourages an approach that blurs the line between practical and creative sound design applications. I had excellent results using Fission [Physion] for transient balancing on bass, and I was able to remedy a track in such a way that I’ve only been able to partially achieve elsewhere. This isn’t your run of the mill transient shaper, this is something very unique indeed... It’s a new way of affecting audio and I like that. 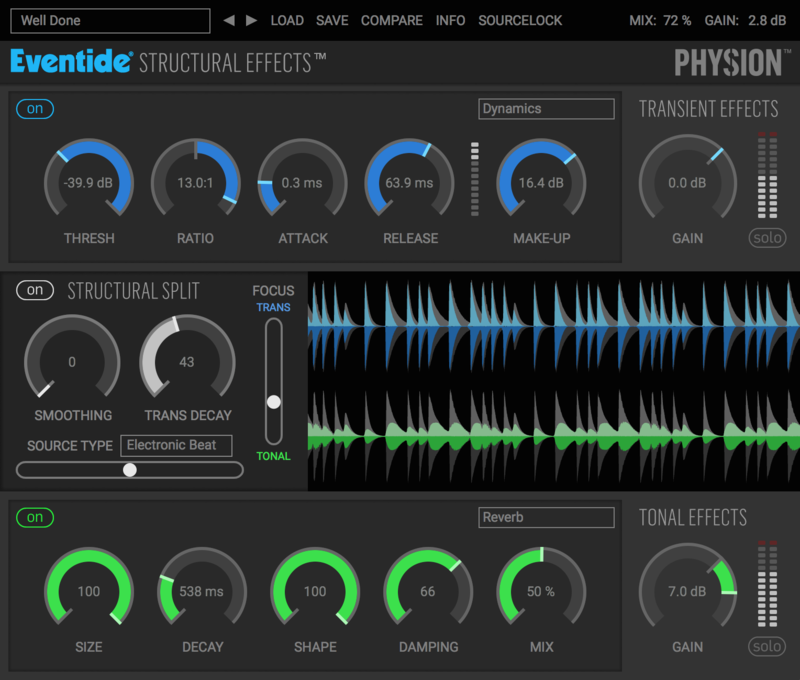 Despite its initial apparent similarity to traditional transient shapers, Eventide has come up with something very new and different with Fission [Physion] creative sound design and audio mangling. 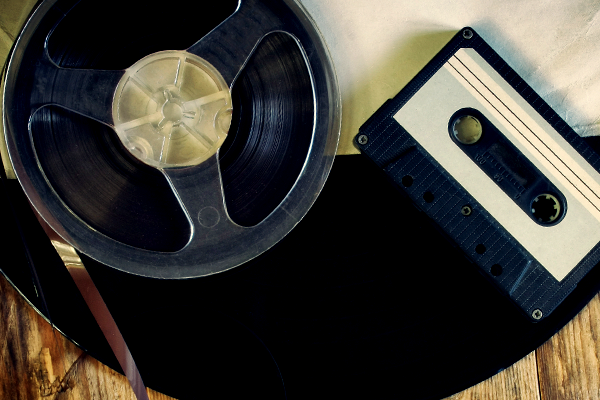 Eventide wants to change how you think about processing audio... 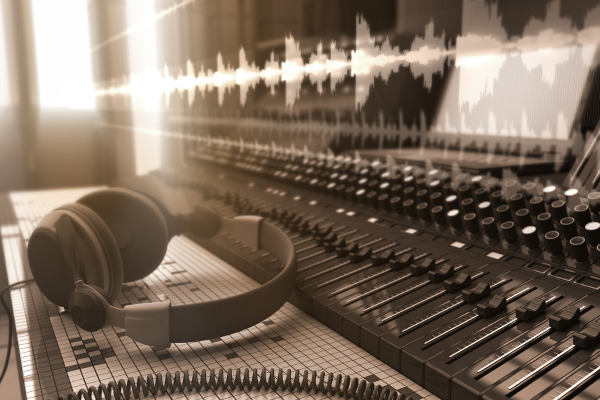 So you could separate the pitched, resonant components of a tom and separate it from the hit, or take fret noise out of a guitar sound, or mangle new sounds entirely. Eventide Fission [Physion] is a seriously great sounding plug-in that stimulates experimentation otherwise not possible. I highly recommend giving it a spin. And kudos to Eventide for really imaginative and creative plug-in development.